Evening everyone! Welcome to our chat with Gavin about analysing our data using Corpus Linguistics. Gavin will let us know a bit about how it’ll all work, we’ll let Gavin know a bit about what our aims are. PSG A: We have some volunteers to be analysts already and we have a couple more spaces to fill. If you think you’d like to be involved, let us know at the end of the chat. (Incidentally we’re also looking for 1 more analyst for the HCPs interviews if anyone is interested in that). A quick update on numbers…. <drumroll> 😉 …. Well done everyone. A few confused people have filled it in and not ticked the box saying the interactions happened in the UK, so we’re at 573 stores from the UK. PSG A: Yes, and we mentioned it IN BIG LETTERS! right above the tick boxes too! I haven’t looked at them to see, but it’s a good question…. PSG A: Gavin, you and I had a chat earlier about what we’re going to do with all those words… would you be able to give us a quick overview? Gavin Brookes: No problem. The first thing to mention is that circa 600 responses is fantastic and 200,000+ words gives us lots of options, so well done everyone involved! Okay, so the techniques we will be using to analyse the data are known as corpus linguistics. For those who didn’t catch the last chat I was involved in, corpus linguistics is a set of methods that use computers to analyse large amounts of language data. These techniques allow us to look at the most frequent words, words which are statistically ‘characteristic’ of our data when we compare it against other language datasets, and to ultimately look at the most frequent language patterns in the data. A good way to go, if this sounds practical and useful, would be for me to carry out the quantitative analysis myself, feedback on the most common thematic patterns in the data, and then for the group members to carry out more manual, thematic analysis on words, phrases and themes that have emerged as frequent or otherwise statistically interesting. PSG B: Are there special software packages you use for the quantitative analysis? Is, packages we might not already have? PSG A: There are free software packages Gavin can show us how to use. Just to mention this would be a core group of up to 6 analysts (let us know if you’d like to get involved). And that group can feed back to the wider group as a whole. Gavin: If that sounds like a good plan, then this would require minimal (though some) technical skill on the part of group members carrying out the analysis, which I can assist with and send video tutorials for, but 90% of this is thematic analysis that basically requires you to read the comments and identify themes and recurring patterns. The benefit of the quantitative analysis that I will carry out is that it will allow us to pinpoint words and phrases of interest and so to focus that analytical attention (rather than reading all 600 comments!). Gavin: The most useful thing for me personally to know at this point is any specific questions/aims or topics that you want to address, as I can explore these kinds of issues in the quantitative analysis, which can then inform the subsequent thematic analysis. PSG A: We had a chat about this on the group earlier. I’ll post some of those here, and everyone please feel free to chip in with your aim and topics also! – how long did they BF each of their children? – why did they stop BFing each child? Gavin: Okay, so for the quantitative analysis, I can divide the data according to the responses to these questions, for example to look at significant differences in the words used by people of different age groups, ethnicity, education level, number of children, etc. PSG F (copied from main group): I want to know which professional group has the most positive impact and which group a negative impact. Whether the age of the mother and age of the child makes a difference – are younger mothers more likely to be affected by bad advice? are positive interactions more prevalent with younger babies than with older children. And I’d like to know if we can identify consistent patterns in good/bad interactions and advice so that we could make some recommendations about who needs better training. I’d also like to know if there are particular issues that recur – for example we already know anecdotally that maternal mental health is an area where women are often told they need to stop bf in order to take medications which is often totally false. Oh my goodness I have so many things I want to know but i’ll stop with this one…. Can HCP advice cause women to stop bf before they wanted to? PSG G: I think it would be interesting to look at what differs between those who stopped breastfeeding “early” (we’d have to define that!) and those who carried on. So, say, <3months versus >3months…..
Gavin: would that be a threshold – 3 months – along which to make comparisons? PSG D: We’d definitely have to define early. And combine that with stopping earlier than they wanted perhaps? PSG A: How many get to 6 months though? Do we also want to capture those who have been put off in the first couple of weeks? Are there 2 questions here? those who didn’t reach the 6 month mark? We could also look at people who did / didn’t meet their goals, as we’ve asked about expected and how long they BF for in the end. PSG B: Maybe six weeks and six months for thresholds? It’s in the 2010 Infant feeding survey, a shocking number don’t make it to something like six weeks given that 80% start off intending to bf. I think the numbers that make it to six months is single digit percentages (1%, 2%). It’s easy to look up. PSG G: Definitely. Although stopping before they wanted could also be confused by returning to work worrys/issues rather than HCPs advice…. PSG A: There are a couple of things here. When I said “established” I wasn’t clear sorry! What I was getting at was a period of time (to be discussed!) at which we would assume most people have BFing established. So if women are stopping BFing in the first couple of weeks, I’m assuming they gave up as they didn’t managed to get established. Perhaps I shouldn’t use that word, as what I really mean is a time early on. Anecdotally, others are giving up around the 4 month mark as the advice used to be to wean at 4 months, the baby food is labelled “from 4 months” even though against guidelines (or at least it used to be – do they still do that?) and so people give up around them for cultural reasons. There may be also other reasons at other times. But my main point was, if we want to look at early weaning, we may need 2 categories for this, as there are strong arguments for both early as in a few weeks and early as in 4 months. Gavin: Okay, that makes sense. If you can indicate to me by the time I receive the data what would be a good threshold to use, I can look at that. PSG H: I think that may be quite telling. PSG A: About when people wanted to, BFing goals are important in BFing advocacy. One reason being, there has been an assumption that the low rates of BFing in the UK could be changed by educating mothers – the implication being that mothers don’t know how good BFing is. But if you ask mothers what their goals for BFing are, and when they stop, another story emerges. Mothers aren’t reaching their own BFing goals (whatever they might be – whether that be a few weeks or months or longer), so something else is happening, and it’s often to do with lack of support. Which has implications for public health – it’s not much use bashing mothers over the head with “breast is best” messages if they already know that! Especially if the issue is lack of support. PSG G: Are these 2 groups getting different advice? Do the 2 groups have different perceptions of the advice they received. PSG H: I’d be really interested in knowing what helped people continue BFing. PSG A: We can get a picture from the qualitative data also. PSG J: This looks interesting and maybe mirrors the findings from the 2016 WBTi report that although midwives have good basic training they are not the ones who give care in the community. The lower group from Paed down could be more knowledgeable if their curricula included the basic BFI module and practical aspects of breastfeeding which currently it doesn’t. We’ve included the WTBi categories in the drop down so we can make these kinds of comparisons with your data. PSG A: Gavin, for reference, the World Breastfeeding Trends Initiative. They do some amazing work. 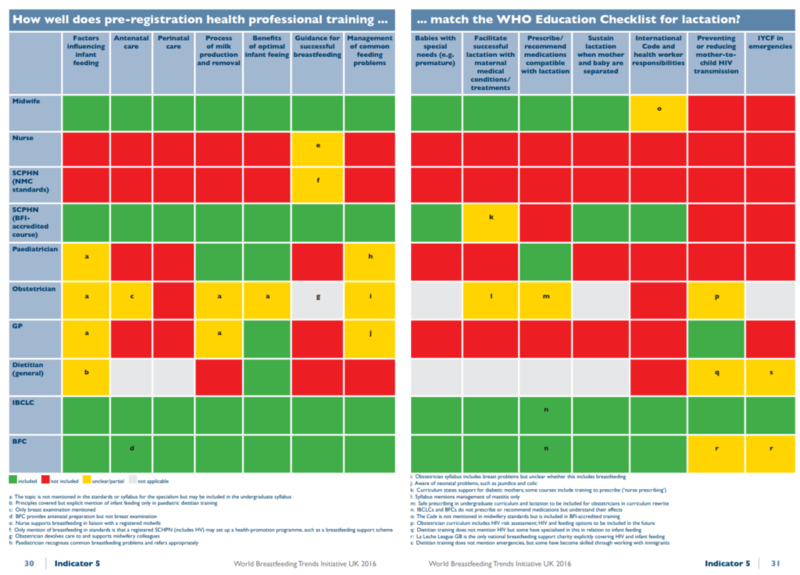 We’ve been particularly interested in their work on recording the amounts of pre-registration training that various HCPs get – see this chart. PSG A: Yes, it’d be interesting to see what women are being advised, irrespective of whether they acted on it. Gavin: Given that [non-UK responses] make up a relatively small proportion of the sample, I wouldn’t have thought that excluding the non-UK responses would make too much of a difference. PSG K: I’d recommend removing non UK. Outside the UK HCP’s and peer supporters may have different kinds of training and work in a completely different healthcare system which may skew the data. If I was peer reviewing the study I’d recommend removing them! Gavin: Good question. To be honest, it depends on the data. You can ‘get away’ with comparing smaller datasets, but the arguments are obviously hedged because we aren’t talking about big numbers. However, if we have evidence in the responses and consistent patterns in those responses then we can make the argument that x or y is happening, with the usual caveats. PSG L (copied from main group): I think we’ll see a lot of GPs being unsupportive of bf past six months, “You’re not still feeding are you? You know there’s no benefit any more?” And also in the early days, lots of HVs and midwives recommending bf-unfriendly practices – being anti-co-sleeping, recommending feeding intervals, jumping to suggest formula top-ups v quickly without investigating other options. PSG J: Exactly and maybe especially from dare I say it female GP’s. PSG M: Is it sensible to work from the basis that BFI is positive in itself? Research shows that women aren’t always comfortable with the way that the BFI is implemented e.g., Hoddinott (2012). PSG B: (copied from main group): Is it easy to break it down regionally? Ie, we’ve asked for the beginning of their postcode, could you do a report of stories from Reading (RG1, RG2 etc)? Gavin: If we have the data then yes. But this might be a little fiddly so could depend on time constraints and how long it takes to do other things. PSG A: Is it a job we could give to a willing volunteer or two to take on perhaps? PSG D: oh good point about moving. How will categorisation of ‘good’ and ‘bad’ interactions happen given that there is no outcome data or medical history, i.e., a person might experience a HCPs advice as ‘bad’ because it wasn’t what they wanted to happen even though it may well be correct advice for the situation? 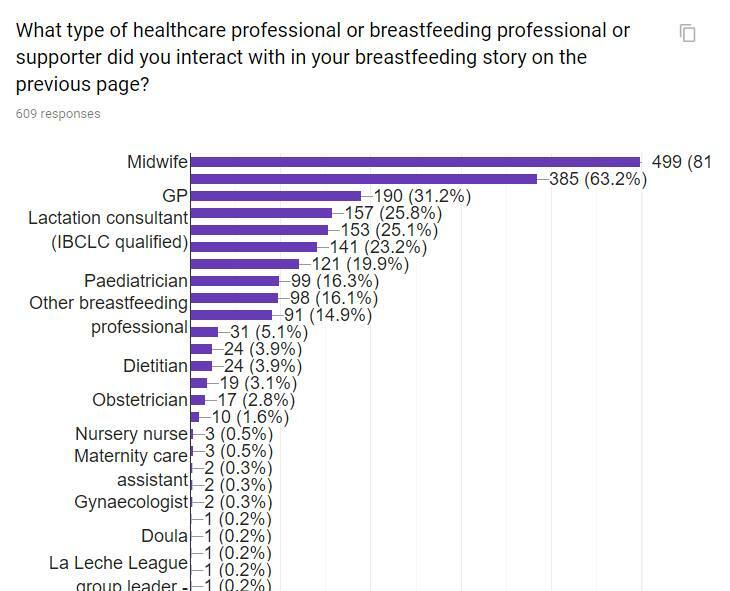 How generalisable will this data be given that we will have no idea of the response rate (high potential for non-response bias) and participants have largely been recruited as far as we can know from Facebook groups and forums with a specific interest in infant feeding? How do you see the findings of this research being applied? PSG G: These are good points!! PSG B (copied from main group): Practicalities: after he’s done some word crunching, what will he give us? Lists of word frequencies and co-locations? Maybe an example from his previous work on NHS feedback? To give us an idea of how we’ll be working together, how much work is involved our end etc. Eg, for the qualitative interview-based project, analysts have had someone training by Skype, have been given typed interview transcripts, are coding/marking up those transcripts identifying interesting recurring things. It’s interesting but also needs a few hours of work per transcript because we’re acting as the analysts. PSG D: I’m really worried I’ve completed the survey wrong…. PSG A: In what way? PSG D: Was I supposed to write one huge journey with about 6 interactions? And I forgot one. PSG A: Yes that’s right, what did you do? PSG C: I confess, I’ve not done it as i was confused.. I have seen 60+ hcp, I cant write about ALL of them over 5 years.. ! PSG A: It’s OK, you don’t need to write about all of them. You write your story of healthcare interactions. We’d love all 60! But back in the real world, you can edit your story and tell the most important bits as you see fit. PSG A: It looks like we have some things to discuss over the weekend, about what we’d like you to look at for us. Gavin: Perhaps Monday if possible? PSG A: We all have brains and eyes 🙂 I think this will go well! How much time do you expect it to take up? I’d potentially be interested. PSG G: How much time do you expect it to take up? I’d potentially be interested. PSG A has agreed a timeline for this – so she should know exactly how long you have (although in total I think it was between 2 and 3 weeks but spread out over a month or so). PSG A: The timeline is – Gavin will have a first go at the data, and get it back to us for Dec 10th. Well look at it and get it back to him for Dec 20th. He’ll get it back to us in the new year (I can’t remember what day we agreed for that off the top of my head,, was it 1st week of Jan Gavin ?) Then, we do our second round of analysis and get it back to him Jan 16th. Then, writing up – but no obligation to get involved with that bit unless you’d like to carry on. Gavin came up with the genius idea of presenting it as a blog for the BMJ it’s prestigious, but we can get it in there quickly. Gavin and the group will write it together. Also infographics etc for HCPs. We need to have a think about what we need / want to do. Then Gavin will write up and submit to a journal later. PSG A: Thank you so much Gavin for your time, this been great, can’t wait to get going!